Leaders with both The City of Boston and the Massachusetts Department of Transportation don’t appear to be heeding critics like these, instead recently pledging further commitment to the cause of multi-modal traffic infrastructure that offers more options for safe access. MassDOT last month released its first-ever Massachusetts Bicycle Transportation Plan with a 10-year trajectory that includes ambitious plans to expand the bike pathway network. The coordinator of the department’s bicycle and pedestrian program told Boston.com now “was absolutely the time to update the bicycle plan,” pointing to marked increases in bicycle ridership the last 10 years. The City of Boston citywide bike count for 2017 was about 40,000. That was 10,000 more than just one year prior, accounting for approximately 10 percent of total daily Boston commuters. Yet while more than half of all daily trips in Boston each day are to a destination three miles away or less, 8 in 10 of those trips is in an automobile. In terms of pollution, traffic jams, parking, accident risk, public health and road maintenance, city and state officials say it just makes more sense to encourage more cycling in the city. The state’s plan is to be calculated in establishing roadway equity among all modes of transport with intent to correct the skewed prioritization motor vehicles have had in Massachusetts for decades. The hope is that over the next 10 years, with additions of more designated and detached bike lanes and other kinds of roadside paths, the more people will be encouraged to ride. It’s been proven the greater separation afforded bicycles and motor vehicles, the more cyclists will be drawn. So-called “high comfort trails” that are wholly separate from traffic, open to bicyclists of many ages, riding abilities and purpose have become extremely popular in New England. The problem in Massachusetts is these trails don’t connect from one to the next. Part of the state’s plan is to fill in the gaps. Another ambition is to connect these pathways to more transit hubs, giving cyclists a more convenient way to traverse the city. These priorities aren’t entirely new. 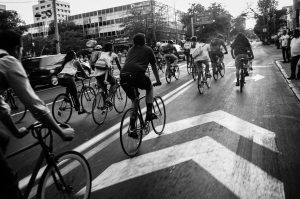 Our Boston bicycle accident attorneys have been watching carefully the last few decades as leaders initiated piecemeal “Complete Street” projects throughout the city. Most of those changes, however, were retroactive, involved repairs and/or an area of high concern. The goal now is to proactive stance with the expansion of new infrastructure – giving bicyclists and pedestrians the space they need to comfortably and safely get to their destination. So far, $60 million has been allocated specifically for these goals. These attitudes aren’t new or shocking, but one hopes increasingly in the minority, especially because they seem to fully miss the point of the city’s plans, namely the priority of creating physical separation if possible. It’s true that protected bicycle lanes result in fewer and/or narrower motor vehicle lanes, and average speed may decline. Lower speeds, of course, mean less risk of crash-related injuries and deaths for all road users, including those in cars and trucks. Further, the slower pace is likely to be offset in many cases where the state plans more traffic-calming roundabouts that don’t require complete stops, keep traffic flowing and reduce crash risks. That’s hardly the sort of tyrannical cycling coup on car drivers Jacoby describes. More accurately, bicycle safety advocates, bicycle accident attorneys and policy makers have dedicated decades in pursuit of a more democratic, safer means of daily travel for everyone – motorists included. It’s unlikely the city or state is going to pedal backward on this now, so this columnist and others may do well to consider the points outlined to law enforcement training manuals from the Massachusetts State Police Academy , which address common misconceptions about roadway bicycling. “Many think) bicyclists should keep off busy streets for their own safety… But studies show repeatedly the biggest threat isn’t the driver approaching from behind. More than 80 percent of car-bike collisions happen at intersections and are related to crossing, entering and turning movements. Bicyclists share all rights and responsibilities as any other road user while engaged on Boston roads. That is by law. So while it may be true Boston roads “weren’t meant for” bikes originally, they’re here now, and we all have a vested interest in making the streets safer for everyone.